We are pleased to announce the launch of Power Manager 4.3. 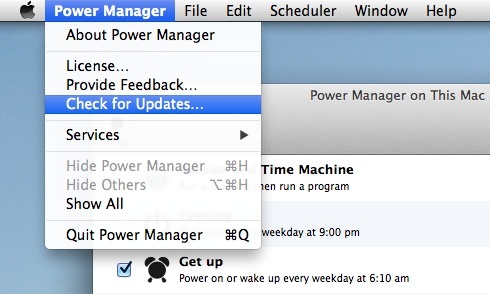 This release introduces support for remote management of Macs running Power Manager. This release also improves support for Apple's forthcoming OS X 10.10, Yosemite. New: Added support for connecting to Bonjour services with pmctl. Refined: Reworked core networking to relieve name resolution from caller. Refined: Schedule Assistant changed to open executable but suffixed files; previously executed. Refined: Added sound to Notifications Center messages; adjust through System Preferences as needed. Refined: Updated notification panel style to better compliment Yosemite. Refined: Updated client and schedule document icons for Yosemite. API: Added CFNetServiceRef and NSNetService support to connection APIs. Bug: Fixed a bug in remote management that could block legitimate access (OS X 10.10). Bug: Fixed pmuser to ensure it never appears in the Dock (OS X 10.10).